1. Quarter the apple and remove the core. Slice the apple into thin slices and then into a julienne (thin sticks). 2. In a bowl, combine apple julienne, green onions, white wine vinegar, and sugar. Let marinade for 5-30 minutes. 3. In another bowl, combine pork, bacon, black pepper, and salt. Mix well until elastic. Once it is elastic, form into 3 burgers. 4. In a saut� pan over high heat, saut� the pork patties until cooked through -- about 5 minutes per side. 5. To serve, coat the bottom of the Kaiser roll with whole grain mustard and then a pork patty. 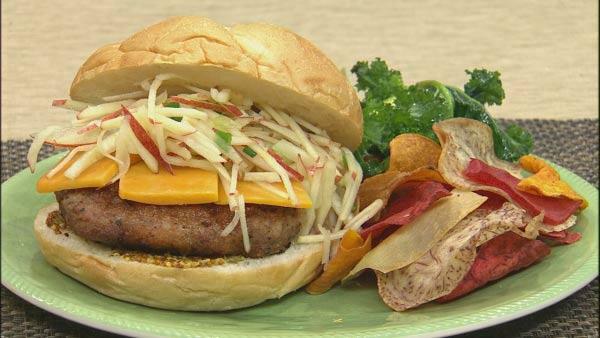 Then, top with cheese, a generous topping of the apple slaw, and the top of the Kaiser roll. Serve additional apple slaw on the side.